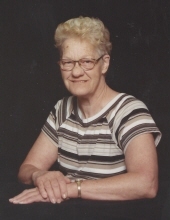 Shirley Rose McChesney, 78, passed away on Sunday, November 11, 2018 in Stillwater, Oklahoma. Viewing and visitation will be held on Wednesday, November 14th from 9am to 8pm. Funeral service will be held on Thursday, November 15th at 11:00am at Dighton Marler Funeral Home Chapel. Interment will be held on Saturday, November 17th at White Chapel Memorial Garden Cemetery in Kansas City, Missouri. Dighton Marler Funeral Home is in charge of arrangements. Shirley was born on January 15, 1940 in Kansas City, Missouri to William Charles Kloiber Sr. and Alice Irene (Ramsey) Kloiber. She grew up in Kansas City and graduated from Wyandotte High School. Shirley married William James Close in Sept 1958 and divorced in 1972. She then married Jack McChesney in 1973 until his death in 1988. She moved permanently to Stillwater in 1992 when her granddaughter was born. She retired from Ford Motor Company in 1990. Her sweetest memories were watching her kids and grandkids growing up. “There is nothing like having your first grandbaby put in your arms.” She loved volunteering especially when it involved kids. She loved being around her family and friends. She is preceded in death by her maternal and paternal grandparents, her parents, her husband Jack, one sister Martha Anderson, two brothers William Kloiber Jr. and Michael Kloiber. She is survived by her son David A. Close, daughters Donna D. McChesney, Molly D. Williams and her husband Robert all of Stillwater; her granddaughter Kimberly R. Bachmann and husband Nickolas, and grandson Riley Williams, all of Stillwater. She is also survived by her siblings James Kloiber and wife Connie of Minooka, Il., Chet Kloiber and wife Janice, Excelsior Springs, Mo., Sharon Farnsworth and husband Jack of Pleasanton, Ks., Patricia Biggs, Pleasanton, Ks., Tom Kloiber and wife Cindy, Palm Beach, Fl., and many nieces and nephews. Memorial contributions can be made in her name to a Children’s charity or the Disabled Veterans or an organization of your choice, c/o Dighton Marler Funeral Home, 5106 N. Washington St., Stillwater, Oklahoma, 74075. Following the service on Thursday there will be a reception at the Moose Lodge of Stillwater. To send flowers or a remembrance gift to the family of Shirley Rose McChesney, please visit our Tribute Store. "Email Address" would like to share the life celebration of Shirley Rose McChesney. Click on the "link" to go to share a favorite memory or leave a condolence message for the family.